2012 Domaine Pierre Guiiemot, Savigny Aux Serpentieres, Premier Cru Red Burgundy. Domaine Pierre Guillemot makes flavorful, fresh and slightly rustic Burgundy with old world character and charm, and while finely made and easy they are not wines that have pretensions or are they in the need of many uncertain years in the cellar. The Guillemot wines are true Cote de Beaune expressions and show the nature of the place very well with red fruits, spice and earthy tones, and their 2012’s are no different, these are solid and focused efforts with slightly better energy, density and length than the last three or four vintages. The 2012 wines will be much rarer, as yields were down by as much as 60% in the region, but admirably Domaine Pierre Guillemot has kept pricing much the same, so if you are a fan of this producer this will be a good year to stock up earthy. Guillemot is one of many traditional producers in Kermit Lynch’s import portfolio, and has been rising up the ranks recently with cleaner winemaking and much better consistency across the lineup which includes a white Savigny and three main red core wines, along with a Corton Grand Cru, but of the main wines I always gravitate to their Savigny-Les-Beaune Rouge offering the Sauvigny Aux Serpentieres Premier Cru, and this latest is no exception, it is my favorite by a mile. 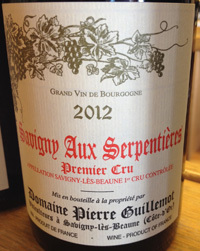 The 2012 Guillmot Savigny Aux Serpentieres is richly layered, brilliantly detailed and very entertaining with bing cherry, plum and tangy raspberry with hints of cracked peppercorn, briar, cinnamon and crushed flowers. The medium ruby hue leads the way into the glass and this Burgundy flows with transparency, lively acidity gives plenty of life and vigor along with hints of earth, wild herbs, anise, mineral/chalky tones and pleasing saline. This is a wine that should gain with short term cellaring, but can without question be enjoyed young, I would advise drinking between 2014 and 2020, this might be Guillemot’s best to date and is hard to beat value-wise!